What exactly IS gelatine anyway, and why the hype? It is a dried powder created from isolating and dehydrating parts of animals, including skin, bones and tissue. This might not sound too appetizing but it’s virtually colourless and tasteless – however it has amazing ‘powers’ of regeneration for the body. 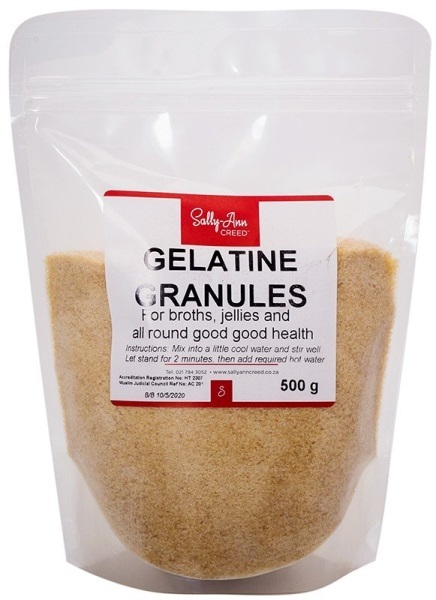 Gelatine helps to form strong cartilage and connective tissue which gives our bodies ‘elasticity’, so we don’t get stiff and sore. Part of the reason for the upswing in the popularity of bone broth is the gelatine it supplies – and the result is that it clears up allergies or food intolerances, digestive issues, leaky gut syndrome, autoimmune disorders and prevents wrinkles. It is made up of 99% pure protein by dry weight. Gelatine (and collagen) is rich in the amino acid glycine, which is useful for preventing and healing joint mobility, digestive issues, cardiovascular issues and skin health. It also strengthens the gut lining and lowers inflammation in the body. Glycine, in addition to other amino acids like proline, is what comprises collagen, which is critical for giving connective tissue throughout the body its strength and durability. Glycine is also important for our ability to naturally detoxify our bodies of heavy metals, chemicals and toxic substances we come into contact with through our diet and environment. Like collagen, gelatine is hugely beneficial for stopping damage to the intestinal tract and protecting the delicate lining, thereby preventing permeability and leaky gut syndrome. Gelatine also helps to maintain a healthy mucosal lining in the stomach, facilitating the balance of digestive enzymes and stomach acid. Without sufficient enzymes and stomach acid you will have all sorts of gut problems like reflux, bloating, nutrient deficiencies, indigestion and even anaemia. The more stressed you are the more you need gelatine and/or collagen to protect your gut. Gelatine is capable of absorbing water and fluids, thereby preventing fluid retention, bloating and constipation. Collagen and gelatine are both known for easing symptoms of osteoarthritis and rheumatoid arthritis, both of which cause joint pain and stiffness. Here’s where gelatin and collagen help stop the chronic inflammatory cascade, which reduces pain and halts progressive disease leading to impairment in joint function. Even exercise-related injury and soreness will benefit from collagen or gelatine. Take around 2 grams a day at least for good results. If you take 3 grams of gelatine before bedtime, you may find your sleep quality change dramatically. Researchers found that gelatine not only improved daytime sleepiness, daytime cognitive functions, sleep quality and sleep efficacy (sleep time/in-bed time), but it shortened the time it took to fall asleep and improved slow-wave sleep without changes in the normal/healthy sleep architecture. Glycine also seems to improve sleep in a different way than traditional sleep medications or hypnotic drugs, which means no drowsiness and side effects the following day. The amino acid glycine is considered an “inhibitory neurotransmitter,” which means it acts similarly to some anti-anxiety or antidepressant medications, only without the unwanted complications and side effects. Glycine naturally boosts mental clarity and calmness and lower “stress hormones” like norepinephrine and increase one’s “happy hormones” like GABA. No more need to worry about developing wrinkles, sun damage, stretch marks and other signs of ageing if you are taking gelatine regularly! Consuming gelatine (and taking collagen directly) can help improve your appearance thanks to its positive effects on skin health and cellular rejuvenation giving skin a youthful, healthy appearance. It even helps to block your skin from UV light damage, wrinkles and potentially skin cancer. One of the reasons we develop signs of aging is because of collagen depletion, which for most people starts in their 20s or early 30s and continues to accelerate. As we lose collagen, we develop cellulite, loose skin and fine lines as a result of skin losing its firmness. Gelatine is so valuable in neutralizing chemical compounds we acquire from eating foods rich in methionine. Methionine has some very beneficial roles in the body, but in excess it can cause problems because it increases the amount of homocysteine in the blood. Consuming gelatine ensures you get a range of important amino acids in healthy amounts to combat homocysteine, and I recommend a good B Complex vitamin daily too. Gelatine is rich in all the nutrients needed to build strong bones and prevent fractures or bone loss, and on top of this, they encourage swift bone healing. Researchers now believe that gelatine (and Pure Hydrolysed Collagen) can act like a safe, therapeutic agent for treating osteoarthritis and osteoporosis. Studies have found that taking gelatine and/or collagen (up to about 20 grams) helps increase satiety and control hunger hormones – great news if you want to lose weight. By increasing the satiety hormone leptin, and lowering the hunger hormone, ghrelin, this could dramatically lower appetite and facilitate weight loss. What’s the Difference between Gelatine and Collagen then? Collagen is the most abundant protein and the major component of connective tissue in the human body, amazingly making up about a quarter of our total body mass. Collagen is a key builder of healthy skin, muscle, tendons, joints, bones and other tissue in both humans and animals, so when we don’t produce we see the sad results. Collagen and gelatine are similar in terms of their benefits because they contain the same amino acids, but their uses are different. Some people digest gelatine a bit more easily, while others find collagen much easier to digest. Gelatine only dissolves in hot water, forming a noticeably gel-like substance when mixed with water, but collagen does not – collagen dissolves quickly and easily in anything. This means gelatine has more practical uses when cooking, such as making your own jellies or thickening sauces and gravies, but collagen is nicer in a smoothie, in coffee or in any food or beverage as it’s tasteless and won’t gel.